Q: Why didn't a customer get an email? / Why am I not getting any feedback? Your Ascend database is not on the June 2018 version or a more current version of Ascend. Check out this article to learn how to update to the latest version of Ascend. The customer asked not to be included in any communications from your store and Include in Communications is unchecked on their profile. The customer has previously unsubscribed from Listen360 survey requests. If a customer unsubscribed from an email sent by another store using Listen360, this customer is also unsubscribed from any other store using Listen360. The customer’s transaction has not yet been finished (closed) in Ascend. 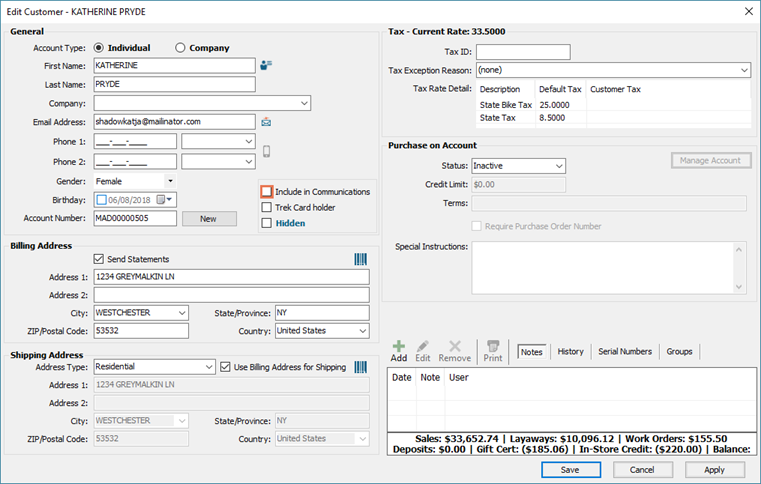 Check the toolbar on the transaction for a Finished date – if there isn’t one, the transaction hasn’t been finalized as a sale. It’s been less than 3 months since the customer was last sent a survey request. Regardless of whether or not they actually responded, they won’t receive a duplicate. A: Once your account is set up (we’ll send you an email to let you know), navigate to app.listen360.com in your preferred browser and log in using your email and password. Q: How do I use my store’s dashboard? A: From your dashboard, you can see a quick snapshot of how your store(s) is performing. You can view your “at risk” customers (detractors), their feedback details, and their contact information. If the customer has an email address, you can email them directly from the dashboard, and a tracking address is automatically included to record your interaction. For other communications, you can manually select the contact method used and record your notes. You can view your Net Promoter Score® (NPS®) percentage value – either overall or for a specific time period – and see how you stack up against other retailers’ average. You can also see your response rate information, promoters’ referral statistics, and your feedback feed. To learn more, see Understanding the Listen360 Dashboard. Q: How do I get immediate alerts when I receive negative feedback? A: Navigate to your user profile and check the alert notifications you wish to receive. To learn more, see Managing Your User Profile. Q: Why can't I see the Reviews section? A: Listen360 automatically created a Reviews section for most retailers, but information was missing for a few retailers and the Reviews section was not created. If you do not see Reviews on the top, right of your Listen360 home screen, contact either Ascend Support or Listen360 Support to help you create this vital piece of the puzzle. Q: I forgot my password. Can you reset it for me? A: Actually, you can do this yourself! From the login page, just click the Forgot your password? link (located directly below the Password field). Fill in your email address, click the Send Instructions button, and check your email for directions on setting up a new password. If you can’t remember what email address you used, contact the Ascend support team, and we can look this up for you. A: We’ve estimated that an individual retailer could expect to pay over $5,000 per year for this service – but with Ascend, it’s just included in your monthly subscription fee! Q: Who has access to my data? A: Your data is your data. We at Ascend have access to your account in case you need troubleshooting, but we do not dive in randomly to see how you're doing. No other company(s) has access to your personal account. Q: How do I update my logo, store name, location information, or other store information? A: Click the Settings tab, then the About [your store name] link. Update your store information as desired. To learn more, see How do I change my logo or color? Sherpa Tip: When we set up your store, we’ll use your Location Name from Ascend. You can adjust how this name displays to your customers, but if you need to change how it displays on your employees’ dashboards, contact the Ascend support team. Q: How often do customers receive emails? A: Customers will only be prompted to review your store once every three month, regardless of how many transactions they’ve had in that timeframe. Promoters who did not complete a review on Google after completing their survey will receive a single additional reminder email, 7 days after their original survey email was sent. Q: How do I view customer information? A: From any review, simply click on the customer’s name to view all of their history since you went live with Listen360. You can also click the Customers tab to filter for specific customers (e.g. by gender or response category). Q: How do I update my alerts? Q: How do I add users? A: Click the Settings tab, then the Users link. Then just fill in the user’s information. Do not use special characters (e.g. apostrophes – ‘ – or umlauts – ¨). To learn more, see How to add Users. Q: How do I turn it off? A: This is a fantastic new tool for you to add to your customer relationship management (CRM) toolkit. There’s no additional cost to you, and you’re not obligated to follow up on your results – you can even turn off all alerts and just review your feedback on your dashboard whenever you have some spare time. But if you still want to disable your account, that’s ok, too – it’s your data, after all! Just contact the Ascend support team, and we’ll take care of the rest. You can always reactivate this service later if you change your mind. Q: I have a new location – how do I set them up? A: Your Ascend installer will take care of this for you once the new location has gone live. The new location will be available to the store owner, who can then set up additional employees as required. Q: What is a Net Promoter Score® (NPS®)? Promoters: Your loyal fans. These customers will return to your store time after time, are likely to spread the word about your store, and will help you build your customer base. Passives: These customers are just ok with your store. They likely didn’t have any issues with your offerings or your employees, but they weren’t “wowed” by the service. They won’t convince anyone to steer clear of your store – but they also aren’t guaranteed to return. Detractors: While these customers are usually considered to be “unhappy,” they may not feel so in the classic sense. Certainly, some could have had a flat-out bad experience – which you should, of course, attempt to rectify – but some may have simply had a “just ok” experience. They are the customers who are most likely to be swayed by your competitors, but they’re also the ones most likely to help you learn how to improve! The percentage of your total detractors (number of individual detractors divided by total number of responses) is subtracted from the percentage of your total promoters (number of individual promoters divided by total number of responses). The percentage of passives is not considered. The final percentage is your Net Promoter Score®. Q: Can I remove or edit reviews? A: Reviews cannot be edited. We don’t recommend removing reviews – the only people who see the NPS® score generated by your reviews in Listen360 are your employees, and this information only helps you improve. But if it’s really necessary – maybe it was a particularly troublesome customer who was impossible to make happy (we get it – sometimes they’re unavoidable) – just email support@listen360.com with the customer's name, date of review, and score. Google reviews must be removed by Google – however, they will only remove reviews which violate their use policies (e.g. spam reviews). Since only your promoters are prompted to review your store on Google, this is a likely scenario. However, if you still feel a review should be removed, you may flag it as inappropriate. Q: Can I prevent a customer from receiving a survey request? A: If you never want a particular customer to receive requests for reviews, uncheck Include in Communications on their profile. However, keep in mind that this will also exclude them from any Trek Connect Retail Marketing (TCRM) emails or from displaying on the Customers on Mail List report. It is not possible to prevent a customer from receiving a review request for a specific transaction. Q: Can I exclude one (or more) of my locations? A: If you are a store owner, you can choose to disable certain locations. To learn more, see How to disable a location/franchise. However, you must have at least one Active location. If you wish to completely disable this service for your store, contact the Ascend support team. Q: Can I see how well individual employees are performing? A: On the Reports tab, click the Technician Performance link. In Listen360, “technician” can be either a salesperson or a service technician. To learn more, see Reporting. Q: Can I view customers who have unsubscribed from emails? 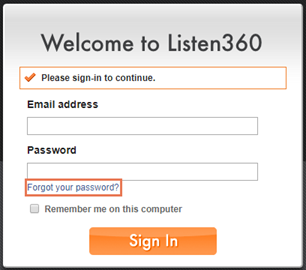 A: Customers who have unsubscribed from emails are removed from Listen360. It is not possible to report on unsubscribed customers. Q: If my server computer was turned off, or Ascend was not running, is all of my missed data sent? A: If your server stopped reporting to Listen360, the previous day’s information is sent when the issue is resolved. If it’s been more than a single day since you stopped reporting to Listen360, previous information can be uploaded manually – contact the Ascend support team for assistance. Q: How do I get more help? A: Listen360’s Support section covers just about every question you may have! If you still can’t find the answer, contact the Ascend support team.